Results of a recent computer cluster usage survey indicated a growing use of Athena, corroborating previous Information Systems projections of usage. "The numbers confirmed the qualitative impressions that one gets by simply wandering through the clusters and looking at what's on the screen," said Naomi B. Schmidt, Manager of Educational Planning and Support for Academic Computing. The survey revealed that most Athena users logged on for an average of 12.9 hours per week and spent a third of their time reading and sending electronic mail, with document preparation and Web browsing also taking up significant portions of login time. "Especially during the daytime, there's a lot of casual use, such as e-mail, [World-Wide Web] browsing, and Zephyr," Schmidt said. "On the other hand, there is also definitely solid use made of our more sophisticated packages. We learn from our yearly rounds visits with academic department heads that more and more departments are depending on high-end software and hardware for teaching their subjects. The most popular third-party software packages (excluding the text editor Emacs, e-mail applications, and Web browsers) were the page-layout program Framemaker and mathematics software Matlab. EZ, another text editor, and Maple, another mathematics package, together with the page-layout software Latex, the spreadsheet Xess, and the C or C++ programming languages were also mentioned frequently. Of those surveyed, 85 percent reported using at least one third-party software package while online. The survey group had 480 people, including 330 undergraduates, 125 graduate students, and 25 faculty, staff members, and researchers. Although "most interviews were conducted during the daytime, and departmental clusters were not surveyed," Schmidt believes the survey is "fairly accurate." 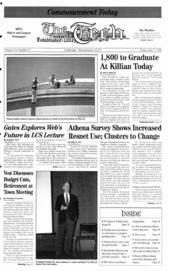 Thirty-five percent of people surveyed in an Athena cluster said that they had access to a computer attached to the MIT campus network. Information Systems would like to move some of the load generated by casual work being done on Athena to students' personal computers, Schmidt said. "Our eventual goal would be to have more low-level, everyday stuff done on students' dorm computers," Schmidt said. "We want to encourage equitable use of our facilities in the short term. In the longer term vision, we have a �three-tier' model under discussion, separated by low-level, mid-range, and high-range computing," she said. "This summer, we are planning on having some of the [Residential Computing Consultants] work on ways to promote effective use of the network from the living groups," said Carla J. Fermann, Senior Consultant of Computing Support Services, a branch of IS. "I think that if people had more information about what was available and the advantages to using it they would be more inclined to do so," she said. "The evolution of Athena to address the changing landscape of technology and its use in MIT education will continue to be an important focus of Academic Computing," said Vijay Kumar, Director of Academic Computing, another branch of IS. That means tracking "not only developments in technology but also� factors such as [the residence network] Resnet and increasing ownership of computers by students," he said. The information gained through the survey will be used to help decide how to spend the $1.6-million budget allocated to Academic Computing for hardware upgrades, Kumar said. "I can speculate that some directions and ideas to explore would include dedicated-use facilities [supporting] specific applications, facilities for short-duration and high-use applications such as e-mail; Macintosh and Windows functionality in some� facilities, as well as more extensive access to some courseware and software tools in the residential halls," Kumar said. "A reasonable approach would be to test some of these approaches on a limited scale this coming year� and develop a plan for implementation,"Kumar said. The goal is to make Athena better suited while still keeping it a robust and powerful tool, Schmidt said. In general, "We plan to brainstorm ways that we can have our facilities used to the best advantage,"she said.